If you have a business that requires using two way radios, you understand how important clear communication is. Early analog technology was good for its time, but problems with poor or no coverage from dead zones, radio interference, the inability to have discreet conversations, and excess background noise could make effective communication tedious and time-consuming. The latest solution is Motorola’s line of MotoTRBO digital radios. 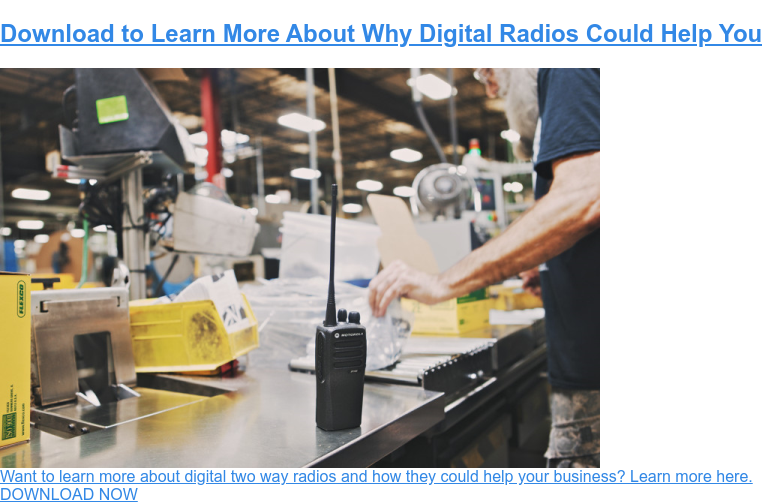 Motorola has taken every communication challenge into consideration in designing these radios, so you can maximize your business performance. How does Motorola provide solutions to those communication challenges? They’ve taken the old concept and streamlined the technology, making it more efficient. There is nothing more frustrating than a system that can’t keep up with work demand, and MotoTRBO’s endurance has been tested to its limits so you know you’re getting top-of-the-line quality. This sophisticated product allows you the confidence that your team have a reliable radio in the field that adapts to support your specific business tasks. This means more productive employees and lower operating costs. Large full color displays standard on the XPR7550 and SL7500 models. Clear audio in digital mode on all radios, including Intelligent Audio to block out background noise. In business, the ability to communicate is not just crucial for smooth everyday operations – in some instances, it’s a matter of life and death. Emergency services, government departments, education and construction are just a few among many industries that appreciate the MotoTRBO products’ ability to keep up with their demands and keep their workers safe with clear communication, emergency features, and light but rugged design. In the past, analog radios, like analog phones, were cumbersome and bulky, and communication breakdowns were all too common. Now, clear communication is possible on both analog and digital frequencies, with special features and sleek design to complete the package. 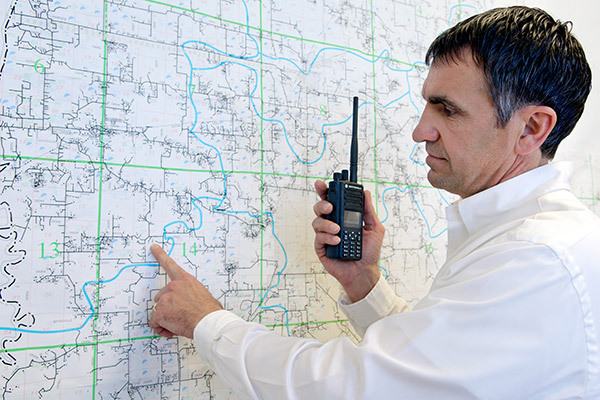 Think of the MotoTRBO as the “smart technology” of two way radios. Even if you have quality equipment, it will require repair from time to time. The staff and dedicated technicians at Motorola provide a stress-free and cost-effective solution to keep your radios in perfect operating condition and guarantee optimal efficiency. In addition to the impressive features the MotorTRBO offers, there’s a wide selection of accessories to choose from to accommodate your unique communication needs. From wireless headsets to battery and charging accessories to carrying cases, we have everything you need to make the MotoTRBO work seamlessly for your business. Whether you’re a new business with a small budget, or a large corporation with hundreds of workers, you need decent equipment. Whatever industry you’re in, we have the equipment to do the job, and the MotoTRBO series is a quality option. If you’re not sure which model is the right one for you, we’ve got plenty of resources to help you choose. Nova Communications also offers a rental option perfect for temporary jobs and events, or if you’re just not ready to commit to a system without field testing it first. Contact us today for more information about MotoTRBO radios and whether they’re the right ones for you or start by taking a look at the MotoTRBO Guide below.